The opportunities for avid surfers within the city are limited—but there are ways for the desperate and the airheaded. Hank and his friend Dude are a little bit of both, and to a dangerous degree. After participating in the annual Mardi Gras parade, drunk as skunks, they surfed on the train coupling of the last suburban line to Bondi Junction and fell off at full speed. Fortunately, they were found quite quickly by some other nighthawks. Hank is lying apathetically on a vacuum mattress with his right thigh severely swollen (Fig. 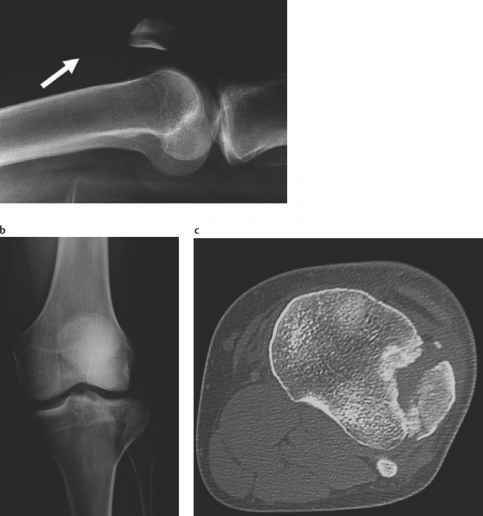 14.44), Dude complains about pain in his right knee (Fig. 14.45) and left foot (Fig. 14.46). Hannah reviews the films toward the end of her shift. Fig. 14.45 a The lateral radiograph already points to a fracture of the tibial head. The pronounced knee joint effusion in the suprapatellar bursa shows a fluid-fluid interface (arrow) indicating a suspended layer of fat, which proves the communication of the joint to the fatty bone marrow. (By the way, this image also helps to understand why life-threatening fat embolism can occur after fractures of large tubular bones.) Only CT could theoretically exclude a fracture in this setting with sufficient certainty. b Theanterior-posterior radiograph clearly demonstrates the tibial fracture. c Before approaching this articular fracture, the surgeons often ask for a CT with 3D reconstructions to find out preoperatively which type of screws should be put in and where. The reconstruction of the articular surface is crucial for the treatment result. Fig. 14.46 Dude has suffered a fracture of his left lateral ankle. These fractures are classified according to Weber. The important issue is the involvement of the distal fibulotibial syndesmosis: If it is torn, the bony fork of the lateral and medial ankle that is tightly fitted around the talus becomes dysfunctional, giving the talus a lot more slack. a The fibular fracture of the Weber A type that Dude has suffered is located distal to the syndesmosis. 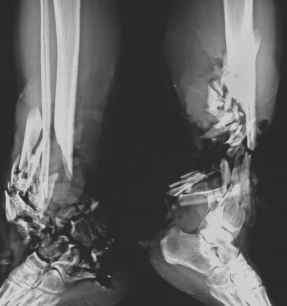 The syndesmosis and the upper ankle joint are thus intact. b With a fibular fracture of the Weber B type, the syndesmosis is involved and loses its stability. c The fibular injury of the Weber C type is a fracture proximal to the syndesmosis, which is, however, also disrupted. 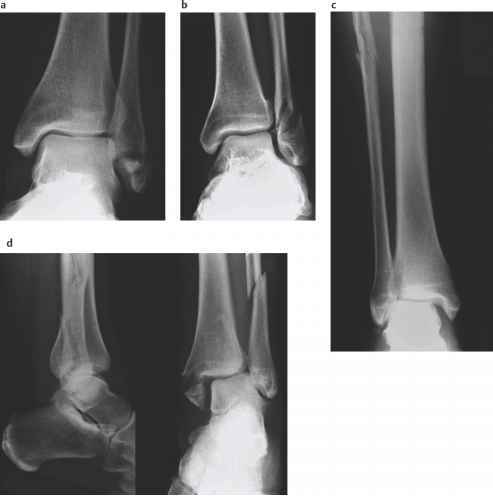 If the Weber C-type fracture is located very high in the proximal fibula, that is, outside of the region normally imaged for an ankle joint problem, it is called a Mai-sonneuve fracture. 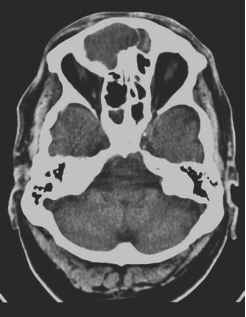 The syndesmosis is also torn in this fracture type. Note the widened medial joint space of the upper ankle joint. d In addition, the medial ankle and the dorsal tibial edge ("Volkmann-triangle") can also be fractured. e How dangerous surfing metropolitan trains can be is documented by these radiographs of an equally careless but considerably less fortunate peer of Hank and Dude.